The Centers for Disease Control and Prevention (CDC) have issued an advisory for travelers to Carnival and Mardi Gras abroad, so that revelers can have a good time and stay safe and healthy, too. It’s good advice for any time, actually. I got to thinking about how the Feldenkrais Method could be useful for Carnival survival — whether you’re dancing the night away in Rio, letting the good times roll in New Orleans, or elbowing your way toward a second (or third) helping at the local church pancake feed. Here are 4 ways to outsmart the worst Mardi Gras health hazards. 1. Awareness. In the Feldenkrais Method, “awareness” is not an abstract or “woo-woo” ideal. It is practical, and always in service to improved functioning. Learn to pay attention: to yourself, to where you are, what is around you, how you plan to get out of there if you need to. To pay attention means that you are gathering information, and “intelligence” in several senses of the word. Better information in the moment means you can make better decisions. 2. Sensory sensitivity: This is an aspect of awareness, but distinct enough to elaborate upon further. We learn, and are encouraged, to ignore our own sensations of pain, and fatigue. We are also taught to ignore or distrust our sensations of pleasure. In short, we numb our unpleasant and vulnerable sensations so that our internal “calibration system” gets all out of whack. As Brene Brown says, the evidence for this numbing is that we are the most in- debt, obese, addicted, and medicated adult cohort in U.S. history. 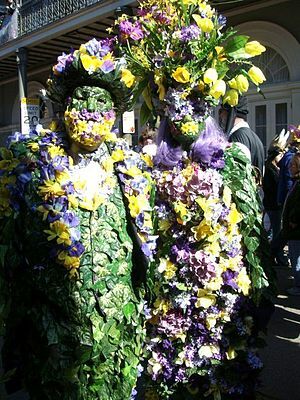 We don’t just overdo it at Mardi Gras. We overdo it every day. 3. Reversibility. In short, don’t do anything past the point of no return. Be able to engage, and disengage, with any movement, situation, or behavior, with ease. See #1, #2. 4. Recovery. Moshe Feldenkrais said that in the wild, the animal who survives is not the one who never gets injured, but rather it is the one who knows how to recover. The crazy, spontaneous, unpredictability of life is what makes it worth living, with good stories to tell about it in the bargain as well. We find our limits by exceeding them. If you overdo it, don’t keep overdoing it. Learn, rest, and recover. Armed with awareness, sensory sensitivity, reversibility, and recovery, you can survive just about anything. Even Mardi Gras.